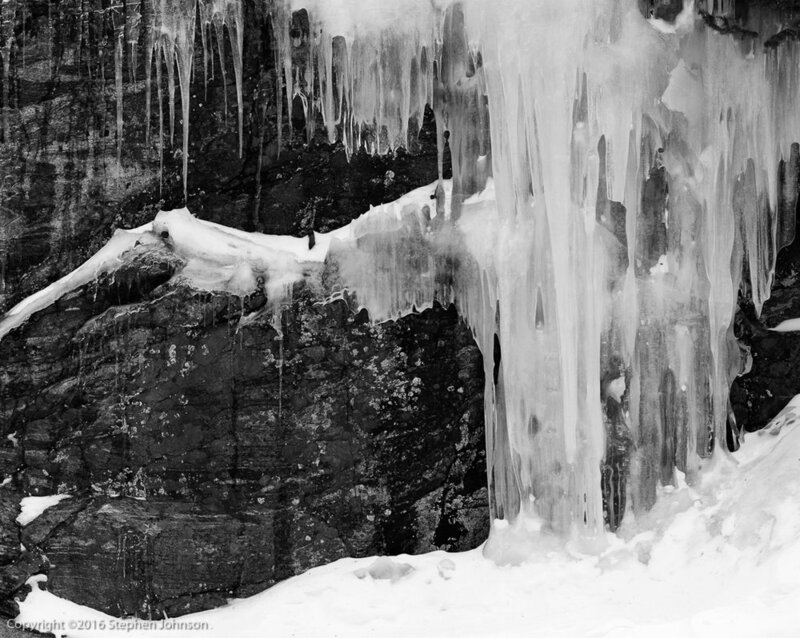 Ice Fall. Bear Lake. Rocky Mountain National Park, CO. 1996. from With a New Eye: The Digital National Parks Project. Betterlight Scanning Back. Welcome to the February 2019 Edition of the Stephen Johnson Photography Newsletter. 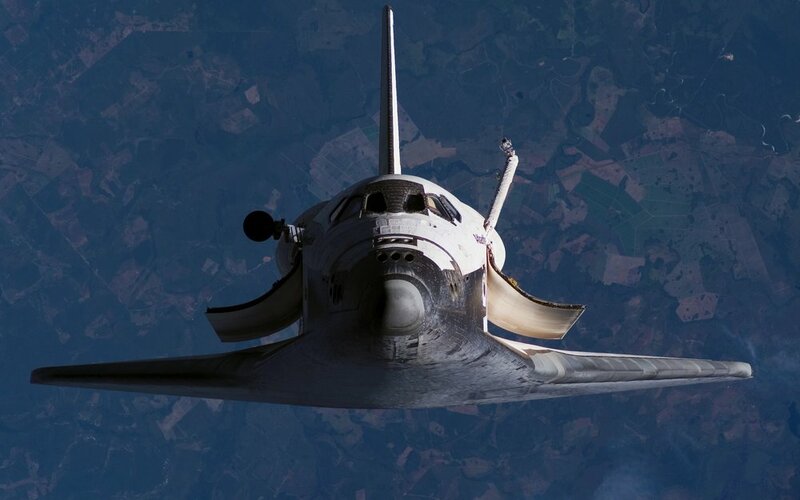 This month's View From Here column tracks my recent visit to a friend and project collaborator and the new exhibit of Space Photographs opening soon. We hope you find the column interesting and will consider sending us some comments. Check out the new workshops we’ve added, including Lighthouses of the Bay Area and Color Management. 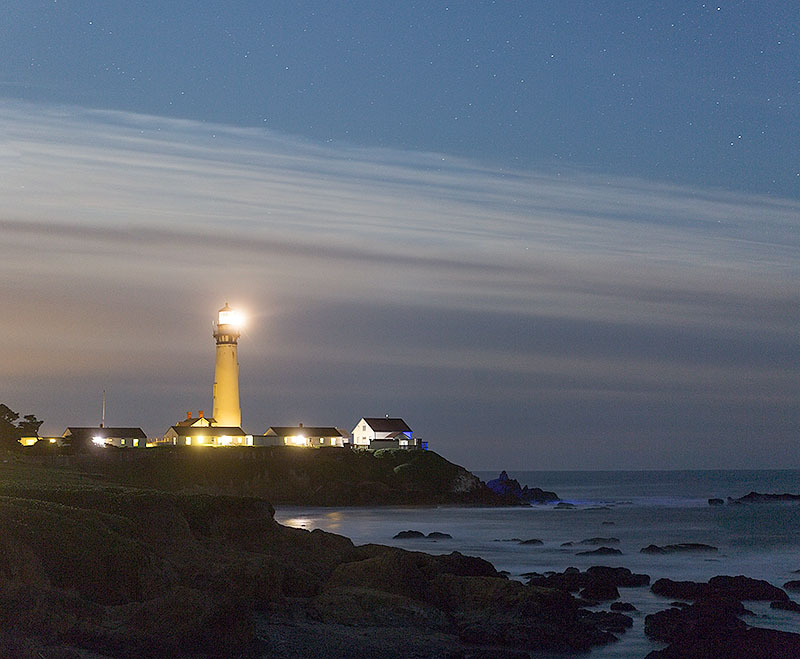 New Lightouse Workshop: We are excited to be offering a new workshop In 2019 that focuses on the lighthouses of the San Francisco Bay Area coastline and the beautiful landscape and ocean settings that they have become monuments to. Other Worldly opens joining the new Space Exhibit with the Life Form Exhibition on display at Stephen Johnson Photography. 2019 Workshop Schedule is forming with these and other great courses coming up. See what a great experience students have had on Steve's Workshops by exploring Workshop Testimonials. A combined exhibition of new prints from over 50 years of Space Photography joining the current Life Form Exhibition for a mind-blowing journey from the living world close-up to the depths of space. 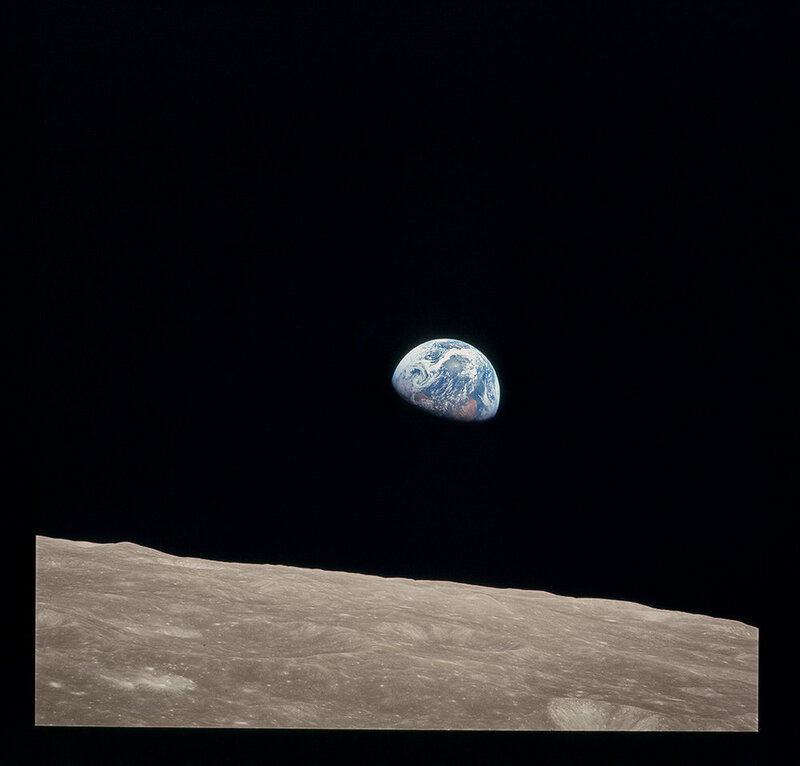 Steve will discuss his exhibition of new prints from over 50 years of Space Photography is joining the current Life Form Exhibition for a mind-blowing journey from the living world close-up to the depths of space. The Space Exhibit evolved out of Steve’s longterm interest in the space program and views offered of the heavens and by spacecraft far away. The concentration on the exotic form of the living world of the Life Form work inspired this expressive look at the wonders of the very large and distant in this print exploration of photographs Steve had been gathering for years. Sky and Beach. Great Highway. San Francisco. 2019. Canon EOS 5DSr. Anytime I’m heading north through San Francisco, I veer west and go up along the beach on the Great Highway. On this particular day the cloud cover was quite beautiful stretching forward, with a brake in the cover on the horizon. I decided a square was a more appropriate composition than a single 35mm aspect ratio. I made two horizontal images, one on top on the other, and stitched them together in Adobe Camera Raw. Other Worldly Exhibition opening February 24, 2019. One of my New Years goals is to spend time with old friends that I haven’t seen for awhile. I am very lucky to have a wide circle of friends who have shared love, companionship and belief in working to make a difference. High up on my list was my old friend Gerry Haslam, author of many works of fiction, non-fiction and our book on the Central Valley, The Great Central Valley: California’s Heartland. Our time together visiting was a sheer pleasure. 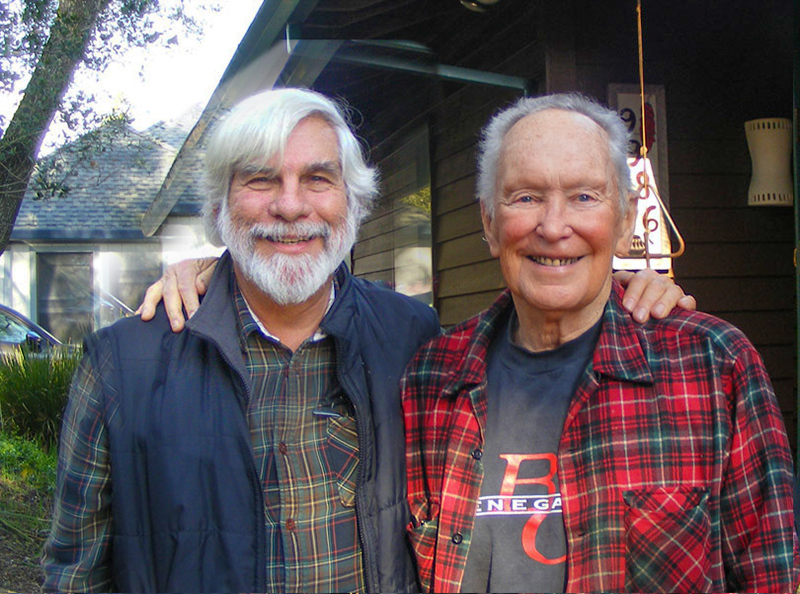 About 1982, as my friend Robert Dawson and I were building our photographic project on the Central Valley, we visited Gerry at his Sonoma State University office. 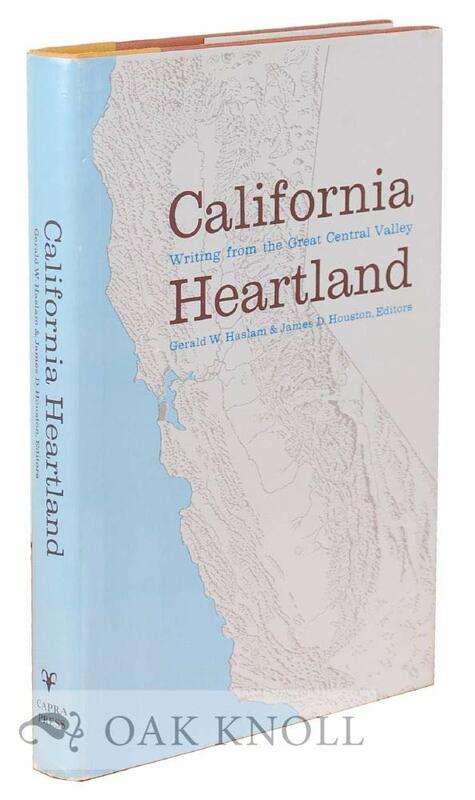 We came to Gerry because of a wonderful book he had done with his friend, writer Jim Houston, California Heartland: Writing from the Great Central Valley. After explaining what we were up to, showing Gerry some photographs, we talked about the photographic exhibition we were building. It wasn’t long before the book we hoped put together came up in conversation. Gerry said on the spot, “I’ll write it.” The partnership was born. The book was published by the University of California Press in 1993. The book was a real adventure in the world of desktop graphic design, evolving software and hardware for scanning and pre-press. Book creation ran from 1989 through 1992. The book took a long time to produce, in many ways, because the technology was developing as I was putting it together. I designed our book in Aldus Pagemaker. Adobe Illustrator was used for the graphics, and the brand new Adobe Photoshop was critical. I had to learn how to use all of them. We needed multi-color (black and gray) multi-plate reproduction of the black and white images to extend the depth of their blacks and still control delicate highlights. In response to our need, Thomas Knoll (author of Photoshop), wrote the Duotone Feature into Photoshop for us (and all of the pre-press world). The book was so deeply steeped in emerging technology that people did not believe it was being created on a Macintosh. I ended up doing a book about how the book was made, Making a Digital Book. Of course, the book project was way overly ambitious, as I typically construct. But the The Great Central Valley: California’s Heartland was nursed to completion, and I am very proud. Steve with Gerald Haslam. Penngrove, CA. 2019. We’re both older, but still deeply appreciative of our partnership that led to a book we a both very proud of. Photo by Jan Haslam. Long before the book, in the weeks after the 1986 Great Central Valley Exhibit opening at the California Academy of Sciences in San Francisco, we put on a Symposium: The Great Central Valley: Heartland in Transition on valley issues. My friend Michael Black organized the day covering issues from water, to poetry, to ethnic diversity, to agriculture. The video above is Gerry’s talk on the Arts Panel. I also gave a talk on that panel. Rebuilding, one year later. Santa Rosa Fire, CA. 2019. Canon EOS 5DSr. After visiting with Gerry, I made a point of driving a little further north to see some of the remnants of the Santa Rosa/Napa Fire from last year. It always feels voyeuristic to visit the scene of a tragedy, photograph a beached whale, or any other instances of sad happenings. But these situations also merit recording, journalistically, and if possible, artistically. That is always a question for me, can I make some sense out of what I see? Can my resulting work make some contribution to understanding? Has enough time passed so that the visit doesn’t feel predatory? My visit was very short this time. I intend to go back soon. Flag and Burned Trees. Santa rosa Fire. 2019. Canon EOS 5DSr. Photography has given us the ability to hold visual memory, to create an independent record of our own mind’s eye experience. It allows us to see again an imitation of what we witnessed with our own eyes and minds. Early on, it became compelling in its minute detail, allowing us to examine at leisure, that which was only fleeting in our human visual experience. Given that photography’s ability to hold what we saw was so powerful, it is now only natural that we would use it to extend photographic sight to more than we can see. Nowadays, through microscopy, space exploration and detection beyond visual our wavelength sensitivity, we are seeing photography give us views into the universe that is more than what we can see, by perception, capability and location. That is a fundamentally enabling and reality broadening tool. We go beyond human experience with photography by encoding time, stopping motion, depth of field concatenating glancing around, dynamic range expansion, wider fields of view, record very dim light, record in black and white and see into infrared, ultraviolet and image radio waves. 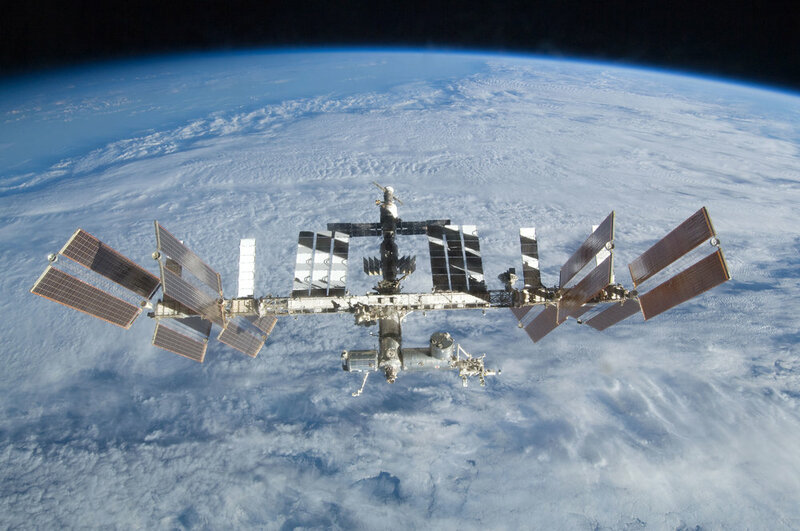 All of this makes my interest in space-based photography almost without limits. From locations I cannot go, to places humans cannot yet go, we can now image energy beyond our human experience. I am completely taken in by all of these possibilities. My new Life Form photographs takes advantage of many of these capabilities. The Life Form work takes me in very sharp focus to a place of appreciation of natural form, its wonder, sensuality, and bizarre elaboration. Many of these very earthly forms seem almost extraterrestrial. It seems natural to add views beyond this planet to the installation. Thus, Other Worldly became the name for both shows hanging together. It is my new exhibition of space photographs, Other Worldly, that has been consuming me lately. I have been gathering together images I’ve been collecting for years, seeking out more images, in the highest quality form publicly available. It has been a detective story and a great exercise in image editing challenges. There have also been some printing challenges, as the “black” of space requires a special black density to satisfy my instincts. The unedited transparency scans from the Apollo missions have been the most challenging, and very revealing. What color is the moon? How had the low light angles effected the apparent color? How did the special Ektachrome film loaded into the astronaut’s special Hasselblad cameras, actually record the color? How have we seen the photographs and become accustomed to their appearance? All of these issues became very real when I managed to find those somewhat raw tiff scans. It is temping to work on getting access to the nearest to original film and scan anew, but short of that, I’ve found some great public resources out there. In playing with printing some space files last spring, my first forays were Lunar Reconnaissance Orbiter (LRO) images of very high resolution. As the LRO camera is essentially a 5000 element scanning camera in lunar orbit, similar technology to my use of the Betterlight Scanning Back in my National Parks Project, this probe has a special place in my heart. That led me to start out experimenting with 40 inch prints. The prints were seductive at that size and made me want to construct a whole show at this large size. 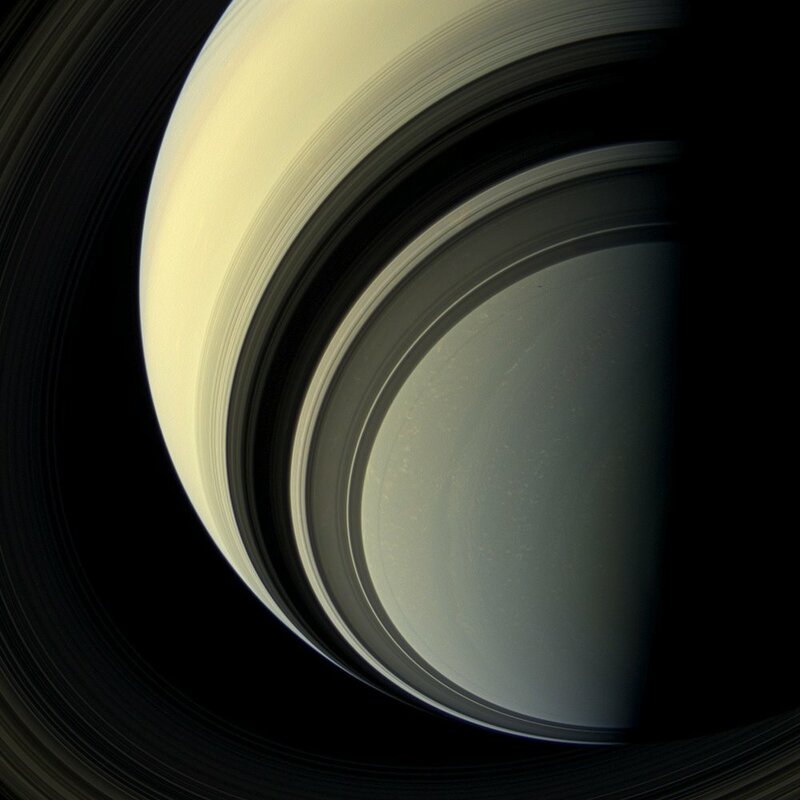 This was a reach for Saturn and Jupiter images, which although fantastic, were not much beyond 1000 pixels. Some of the Hubble Space Telescope images are very high resolution, having been built up from multiple images. As we now have access to photographs processed through very sophisticated software with multi-spectral cameras, and radar data, planetary modeling combinations of many images run though software can construct whole planet renderings. All told, this show is comprised of images from spacecraft developed/scanned film, digital and analog sensors, scanned transparency and black white negatives. I have tried to mold them into a single approach that makes for a tightly integrated exhibition. This exhibit came into existence by way of my love of the images, my curiosity, and a unique feature of the my Canon imagePrograf 4000 printer. The printer has an optional self-loading second roll paper capability. The self-loading feature made the testing on sheet paper, then printing on large rolls, a simple auto-switch task. This, coupled with support from Canon for ink and paper under my Explorer of Light contract, made the play of exploring these prints irresistible. Presentation was also an instant issue. Having just mounted a major exhibition last year, my Life Form show, the prospect of raising funds for another big framing project did not sound practical or appealing. Instead I decided to go for mounting the prints directly to acid-free foam-core board and work out how to get them up on the wall as the months progressed. Considering framing options, I found in my frame stash a 40 inch frameset, then decided to check out the price of buying all of the frame materials necessary for the show. Even assuming all prints just being 40x40 inches, it still entailed over $1000 committed. So I passed on the frames. I came up with a new adage to always keep in mind, the “creeping reality of complete impracticality” seemed to fit the aspiration. Smithsonian Website Caption: Dec. 13, 1972, scientist-astronaut Harrison H. Schmitt is photographed standing next to a huge, split lunar boulder during the third Apollo 17 extravehicular activity (EVA) at the Taurus-Littrow landing site. The Lunar Roving Vehicle (LRV), which transported Schmitt and Eugene A. Cernan to this extravehicular station from their Lunar Module (LM), is seen in the background. The mosaic is made from two frames from Apollo 17 Hasselblad magazine 140. The two frames were photographed by Cernan. Hasselblad Lunar Film Magazine with exposure instructions. Smithsonian National Air & Space Museum. Steve with Hasselblad Moon Camera. Eastman House Museum. 2012. Hasselblad Lunar Film Magazine. 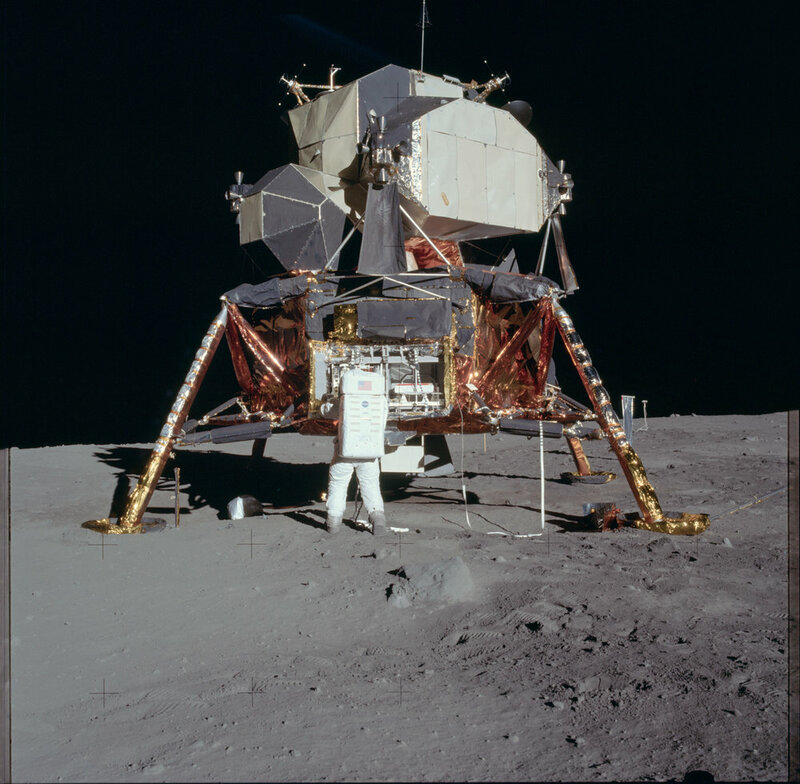 During the Apollo 11 mission, Magazine R was used inside the lunar module "Eagle." Smithsonian National Air & Space Museum. Prints along gallery wall prior to installation. 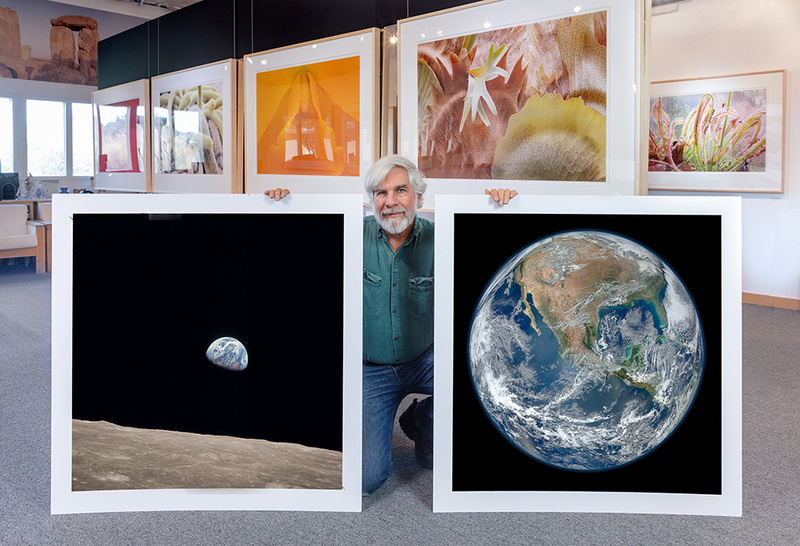 Steve with two new prints for the space exhibit. 2019. I've been working on more prints for my upcoming space photos exhibit. Prints of the Sun and Jupiter have remained priorities, and have been challenging. Twenty-one 40 inch prints are already complete, 10 more are printed and not yet mounted. There are more prints I have to show than I have wall space, so there will be a number of prints in bins to view and purchase. The upcoming Black and White class and Fine Art Printing workshops are open for enrollment now. Enroll while there is time and space! Life Form opened in the Main Gallery at Stephen Johnson Photography on July 21, 2018. The show has been extended through August 2019. We have had many visitors come by the gallery since the opening. Many have then joined workshops and certainly helped build community. Please come see the show. Pass the word. We are seeking good venues to show this work. The Life Form Series is now available for museum and gallery exhibition after August 2019. We hope you can come by the gallery and see the original prints in the new Life Form Gallery and its new Life Form Portfolio, the Exquisite Earth exhibition with its accompanying very special Exquisite Earth Portfolio 1. We invite you to join us on a workshop, rent lab space, or just say hello and let us know what you are up to photographically and what you might like to see us offer. We value your input. In 2017 we replaced the Epson 2400s in our lab with their new P600s and consequently have some printers to seed to photographers in need. We were also given some Epson Canvas to share. These are available for pick-up to those of you on my mailing list. Let me know of your interest. I do want to spread them out among a few people. Additionally, I rescued a few Besleler Enlargers, a 23c and 4x5, hoping to find good homes for them. Make an offer. $10 (free shipping) proceeds go the Pacifica Land Trust a non-profit 501c3.